Winter Hunt in a box! 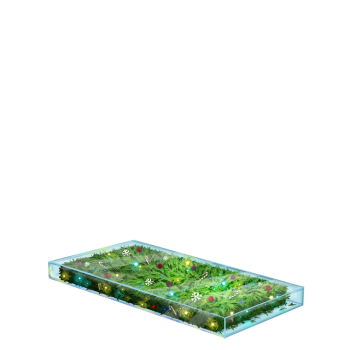 Compress your Winter Hunt tree into this lovely crystal box that doubles as a base! You can now rememeber it all year round just as you left it. The Festive Winter Hunt Base is a base that was first made available during the Great Winter Hunt 2017 event. It could be purchased from the Great Winter Hunt 2017 Trapsmith in exchange for 127,000 gold and 1 Nugget of Nougat. Gingerbread Base - Available only during Great Winter Hunt events. 12 December 2017: The Festive Winter Hunt Base was introduced as part of the Great Winter Hunt 2017. This page was last edited on 14 January 2019, at 13:31.